In a Montessori education, nature plays a key role in inspiring wonder in children. The Montessori philosophy emphasizes forming a strong bond between children and their environment. By getting your child to play and learn through outdoor science activities, you can begin a lifelong appreciation for nature. Here are a few fun and engaging science experiments that you can do with your child to help them connect to the environment around them. Little animals like worms are often fascinating for children. If you find that your child is captivated by these little critters too, they will love creating a worm observation tower. This is also a great opportunity to teach your child to be kind to animals by handling them gently. To make the worm observation tower, choose a glass vase or bin that you don’t mind getting dirty and have your child fill it up with sand and dirt. Pour a small amount of water into the container to make the soil damp and easier for the worms to crawl through. After the container is prepared, help your child go worm digging in your garden or lifting rocks and seeing if there’s anything wriggling around underneath. Then you can fill your container with any worms you that you find and let your child watch as they crawl around. Your child will enjoy observing their new worm friends as they poke around through their temporary home! This fun and easy activity is appropriate for children of all ages. 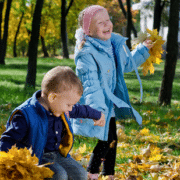 Start off by going on a nature walk with your child and allowing them to collect any objects that they find interesting, such as leaves, flowers, rocks, sticks, and acorns. After they collect their treasures, have them sort them into two piles: one for objects that they think will sink and another for objects that they think will float. Then you can fill a bowl with water to test out their theories. Allow them to experiment and see if they can make a floating object sink by putting other objects on top of it. This is a great chance for you to teach your children about weight and density. The fossil layers give us clues about how the environment has changed over time. Limestone is a unique rock because it is made up of these layers. Because limestone forms through evaporation, it can be found in a variety of environments. Children are usually impressed by limestone rocks because they can also be used as chalk. Encourage your child to look around damp environments, such as creeks or lakes, for brownish-yellow and grey colored rocks. After your child collects a few rocks, put each rock into a separate bowl outside. To identify limestone rock, pour vinegar on each rock and wait a few seconds to see what happens. Little bubbles will form all over the rock in less than a minute if it is a limestone, while nothing will happen to other rocks. This is the perfect opportunity to tell your child that a chemical reaction is going on because the vinegar is an acid and limestone is a base. Explain to your child that when an acid and a base mix, they create heat, which is the reason the bubbles formed. Solar s’mores are a creative and delicious way for children to learn about how strong the sun is! You can create a solar oven by grabbing a leftover pizza box, covering the top of the flap with aluminum foil, and covering the bottom of the flap with plastic wrap. Place black construction paper on the bottom of the box and line the sides of the box with additional aluminum foil. While you create your makeshift oven, you can explain the function of each step to your child. For example, you can explain how the aluminum foil works to reflect the rays of the sun and how the black construction paper is used to absorb heat. When your oven is ready, your child can fill it with all of the necessary ingredients for s’mores – graham crackers, marshmallows, and chocolate. The s’mores will usually take around an hour to cook like this. While you wait, you can explain the virtue of patience to your child. When you see that the chocolate and marshmallows have melted into something gooey, you and your child are free to enjoy your delicious solar s’mores! As Montessori parents, you want your child to become a part of the emerging world community and to help build that community in the future. Here at the Montessori Academy at Sharon Springs we recognize the importance of global citizenship and how it develops from birth into adulthood. That’s why we make global citizenship a key focus in our cosmic education. From a young age, each child should begin to understand that they are individuals who are a part of the human species, a member of society, and on a much larger scale, a citizen of the world. By nurturing this awareness of the world, the child will begin to develop a universal understanding and appreciation of all life on earth. As Maria Montessori wrote in To Educate the Human Potential, “Since it has been seen to be necessary to give so much to the child, let us give him a vision of the whole universe. The universe is an imposing reality, and an answer to all questions.” Montessori’s visionary idea was based on her observations of children’s eagerness to understand themselves, the world, and how they fit into it. Montessori also discussed the proper time for a child to be exposed to all items of culture, which she said was at six years of age. This age, she said, is optimal because children are enthusiastic about receiving items of culture. She compared this process to the germination of a seed that will expand and grow if these elements of culture are introduced at the proper time and in the correct way. “A need arises for a special method, whereby all factors of culture may be introduced to the six-year-old; not in a syllabus to be imposed on him, or with exactitude of detail, but in the broadcasting of the maximum number of seeds of interest,” wrote Montessori. According to Montessori, we have a moral responsibility or a “cosmic task” to protect humankind from the threat of self-annihilation caused by the impact of our species’ destructive actions. Nurturing the core value of global citizenship is meant to prepare children to successfully handle the issues that the modern world faces in a peaceful way. At MASS, we encourage our students to use their conscious minds and imaginations to explore the diversity of cultures and how communities around the world live and work differently. By cultivating a profound respect for cultures and the world as a whole, we hope to develop a generation of adolescents who value global connectedness and are able to collaborate with people across all nations and cultures. As a parent you want to find a stimulating learning environment that maximizes your child’s early learning experience, setting the stage for a positive relationship with education. The Montessori curriculum, developed by Maria Montessori, is a child-centered approach to education that treats children as individuals, focuses on the “whole child” and nurtures curiosity, developing students who possess a deep love of learning that lasts a lifetime. Our school offers a close-knit community dedicated to meeting your child’s unique needs in a manner not typically found in a traditional daycare setting. Guided individual choice is a key component of the Montessori approach and students are encouraged to work independently on lessons, or work, of their own choosing. Montessori classrooms contain distinctive learning materials designed for hands-on learning. Each lesson first teaches a single concept and as students progress to more complex levels, teachers replace materials with ones that ensure that the level of challenge continues to meet a child’s individual need. A Montessori education allows students to deeply explore subject matter as long as academic value is being gained. This educational method teaches children to be self-motivated as an active participant determining their own learning path and progressing at their own pace. Montessori classrooms are multi-age allowing students to participate in group activities, learn from and mentor children of different ages. This helps to teach responsibility, cooperation and leadership which are important life skills that benefit all children. Developing a child’s ability to concentrate on tasks is one of the many benefits of a Montessori education. An outside observer may wonder how a Montessori classroom encourages choice as classrooms are meticulously and thoughtfully arranged. It is this sense of order that sets the stage for learning activity that is focused and calm. Learning materials are placed on child-height, uncluttered shelves which fosters independence as students can go about their work, on their own with confidence, as a result of everything being where it’s supposed to be. This creates focus and harmony in students that inspires joyful learning. You might observe your child repeating the same task, such as washing a table, sewing a button, or counting small objects. It is important to know that each of these tasks involves a multi-step process where your child takes out the materials, completes the activity, and cleans up after himself. These activities instill the mindset that focusing on the details of a task is important. This mindset is necessary for a child to complete more difficult lessons in the future, such as reading or long division. Montessori classrooms contain hands-on learning materials. You will not see teachers lecturing on topics to all students simultaneously or asking students to memorize facts; teachers encourage students to see things with their eyes and feel things with their hands. Lessons are taught using materials that are interesting and engaging , such as the movable alphabet to spell words and animal figures to learn about classification. This interactive, practical approach to learning helps students to understand abstract and complex concepts. In a study published by Psychological Science, students with hands-on learning experience performed better on tests than students with traditional learning experience. These are just a few examples of how a Montessori school environment delivers an education experience and outcomes that differ from traditional daycare centers. To learn more about our educational offerings check out the programs section on our website. We also encourage you to schedule a tour to visit our school, see firsthand the benefits of a Montessori education, and discuss the questions important to your family with one of our certified teachers. Today we continue our series exploring the Practical Life area of the Montessori classroom, focusing in this post on the ways in which Practical Life skills benefit other curriculum areas. Many of the exercises in the Practical Life area are preparation exercises of Sensorial works. The exercises help to fine tune the development of the child’s senses. Many uses of the five senses occur in the Practical Life area: sound, sight, and touch are used in equipment-bases activities, such as bean scooping; smelling and tasting are involved in the preparation of food. Practical Life not only develops the child’s senses and teaches real life skills, but sets the basic foundation for other areas to come. 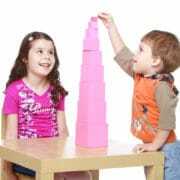 For example, understanding size, weight, and equal distribution are skills which are vital when the child is introduced to the Math area of the classroom. Perhaps the most significant is the development of the pincer grip, which allows the child to correctly grip a pencil and begin working in the Language area. Montessori’s education program is unique. Children are encouraged to make decisions and play an active role in the classroom. A solid foundation at each level promotes strong academic skills and a true love of learning. An authentic Montessori program is based on self-direction, builds a strong sense of self, sustained concentration and development of independence. What sets Montessori apart from other programs? Montessori grows a child’s love of learning by providing an excellent foundation, creating a well-rounded individual that leads the way to a more advanced education. Would you like to share this content with friends and family who are curious about Montessori or interested in enrolling? Click below to share via email or post to your social networks – or get a printable version here. Studies show that students do not enjoy working at home on the same things that they are doing at school, and that students who do a lot of paperwork for homework are not as efficient in class. Technology can be a great way for children to practice skills they are learning at school in a format that engages their mind and interest in a different way. Students are increasingly engaging with technology through smart phone and tablet apps, and a growing number of these activities are Montessori-themed. But are “Montessori apps” effective? Bobby and June George, owners of Baan Dek Montessori in Souix Falls, South Dakota, and of Montessorium, a company devoted to creating “self-guided learning experiences for children,” maintain that they are. In their interview with blogger Lori Bourne of Montessori for Everyone, the Georges give a brief overview of their products, how they got started, and why they consider their products to be true to traditional Montessori ideology. Montessori Primer – What Are Typical Uses of Technology In a Montessori Classroom? Maria Montessori saw children as global citizens who need to learn real-world concepts, and in a Montessori classroom, children are actively engaged in real-world learning. Technology has the potential to play an important role in this dynamic approach when computers are used as a tool to reinforce skills – to be relatable to the life skills children are developing – rather than as the focus of a specific computer education class taught within a one hour period in isolation. Currently in our classrooms, there are iPads and desktop computers. The students use these tools to enhance research and presentation, and to reinforce skills learned within the classroom. At the elementary level, students learn to create PowerPoint presentations and videos to support the communication of their research. An example at the primary level may include using the computer to watch an educational video showing how seeds grow, reinforcing scientific concepts and inspiring the children on gardening day. 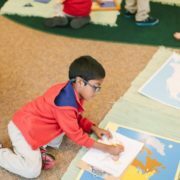 In her article Integrating Technology into the Montessori Elementary Classroom, former Montessori educator and current education advocate Elizabet Hubbell describes in detail a full school day of a lower elementary Montessori student and how technology plays a major role in her educational journey. The beginning of the article is a brief overview of a staple in a Lower Elementary classroom – the work plan. The work plan is used as an organizational tool for both student and teacher. Although the work plan varies from classroom to classroom, the essential part is usually present; subjects/areas to be practiced throughout a specific week. The students are responsible for completing tasks and the teacher uses it to notate areas of focus for each child as well as a record keeping tool. The article then follows the child from one work to the other and demonstrates how technology is incorporated in several aspects of the classroom. First, the child works on creating “Famous Places” cards to add to the classroom collection. She uses the computer to research, create, add pictures, and resize the card to match the ones already in place. The article then touches on other sections of the classroom where technology has been and continues to play a major role, including a plethora of ways to incorporate technology to help children manipulate math in a high tech way. Although this article does not specifically measure student learning outcomes, it does provide a good base for usage of technology in many facets of the Lower Elementary classroom. It also provides many specific examples, including work created by students through the use of classroom technology. Hubbell also addresses the negative outlook some Montessorians might have of integrating the “new” with the “old school” way of teaching Montessori by validating positive learning experiences provided by the use of technology. Please join us for our next post as we look at the use of technology in the home! https://montessoriacademysharonsprings.com/wp-content/uploads/2016/01/logo.png 0 0 Judd Dunagan https://montessoriacademysharonsprings.com/wp-content/uploads/2016/01/logo.png Judd Dunagan2013-12-04 19:34:022017-08-30 17:27:55Montessori Primer - What Are Typical Uses of Technology In a Montessori Classroom? Montessori Primer – Where Does Technology Fit in a Montessori Environment? The incorporation of technology into the Montessori classroom is a choice that must be considered in each Montessori school. Some Montessori schools embrace technology; other Montessori schools prohibit its use. One might wonder, What would Maria Montessori have thought? In studying Dr. Montessori’s life, it is evident that her scientific and educational ideas were revolutionary in the early 1900’s. In observing and encouraging change based on the needs of the children, she created a methodology for teaching that was very progressive for the Industrial Age. The following chart, based on information shared on former Montessori educator and current education advocate Elizabeth Hubbell’s blog, illustrates that – though Montessori worked in the Industrial Age – her approach to education and child development were ahead of their time, and are perfectly suited to learning in the Information Age. Please join us throughout the coming week as we examine the integration of technology into the Montessori classroom and the home! https://montessoriacademysharonsprings.com/wp-content/uploads/2016/01/logo.png 0 0 Judd Dunagan https://montessoriacademysharonsprings.com/wp-content/uploads/2016/01/logo.png Judd Dunagan2013-12-03 10:21:052017-11-13 07:04:28Montessori Primer - Where Does Technology Fit in a Montessori Environment?